Oh my goodness, my heart! This weekend I went to see Call Me By Your Name. 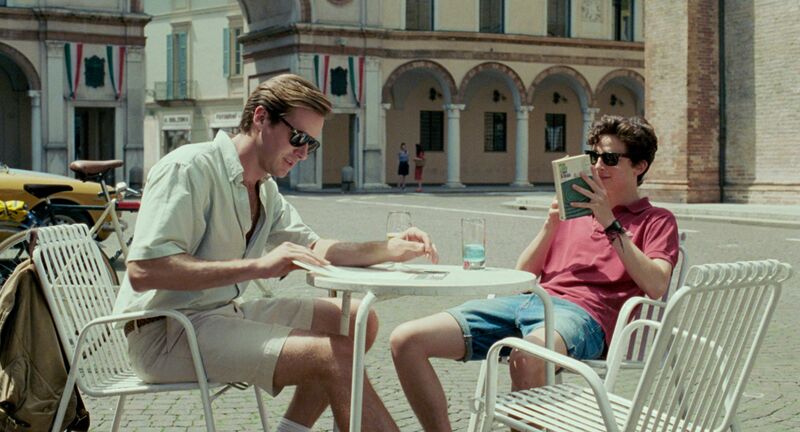 Starring Timothee Chalamet and Armie Hammer, CMBYN tells the story of Elio and Oliver as they fall in love during a magical summer in northern Italy. The movie is an astounding work of art, both spell-binding and heartbreaking. I love the feel of this movie. It’s well crafted but doesn’t feel contrived. From the colors to the music, it has a distinct feel that pulls you in so that you feel like you are with Elio and Oliver in Crema, Italy. I can’t stop listening to the soundtrack on Spotify (Sufjan Stevens and classical piano, anyone?) SO GOOD. Also, the town is gorgeous. Be right back, booking a flight to Italy now! While the aesthetic of the film is lush and idyllic, the interactions between the characters are anything but. Over the course of two hours, the audience watches the awkward lurches and starts of romance and attraction between Elio and Oliver, which somehow makes the two characters even more lovable than they already are. We see them as real, vulnerable, and unsure. Unlike the statues of Greek Gods that they unearth in they study with Elio’s father, these are flawed characters that we can relate to. This film was very emotional. I expected I would get teary-eyed, but I didn’t expect to be bawling in the movie theater. The guy next to me even looked over to see what was going on. “Nope, nothing to see here sir, just me crying my eyes out…” Elio and Oliver confess their love for one another and enjoy a passionate but short-lived romance. There were a number of scenes that were so well done but so heartbreaking at the same time. In the moment when Oliver discover’s the peach, Elio is filled with shame. But when Oliver doesn’t shy away, Elio realizes that Oliver cares for him deeply and he breaks down crying, saying that he doesn’t want Oliver to go. There’s also the scene where Elio says goodbye to Oliver at the train station. He holds it together pretty well, until he calls his mom to pick him up and his voice cracks. My heart. Oh my heart. As if that wasn’t sad enough, we later watch as he digests the news that Oliver has gotten engaged. Timothee does such an amazing job of portraying Elio as he reels from the grief that comes with the loss of one’s first love, and I think it’s something everyone can relate to. I don’t know how this movie will fully play out at the Oscars, and honestly I don’t fully know how it will affect me. Awards or not, what I do know is that it made me feel validated and seen and known, and I imagine the sentiment is even more so for those in the LGBT community. I am absolutely blown away and cannot wait to see more from Luca and Timothee and Armie.